Have you ever wondered how the bodybuilding lifestyle affects one’s kids and family dynamic? In today’s episode, the coaches discuss how living the lifestyle they do, training, dieting, posing, etc., affects their kids. Throughout the episode, the coaches cover topics such as the importance of instilling the notion that bodybuilding is a sport, how they approach social media as parents and role models, their kids’ training programs, and more. 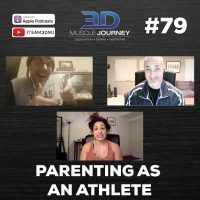 If you are a parent or plan to become a parent, and also live the bodybuilding lifestyle, this episode provides valuable insights and unique perspectives for how this can affect those closest to you. Join us this week to learn how two bodybuilding pros, coaches, and parents, raise their kids in a bodybuilding-oriented environment.